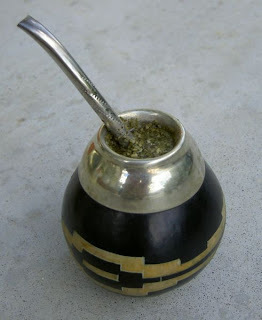 Tereré is an infusion made of yerba mate (erva mate). It is prepared with cold water and in a slightly large vessel. It exists in Paraguay, northeastern and southern and western Brazil. In Paraguay people prepare it water infused herbs like mint or lemongrass. In northeastern Argentina and Brazil fruit juices are added to Tereré. Argentinians add lime and orange juices. In Brazil lime and pineapple are added. In Argentina Tereré with juice is called "Tereré ruso" (Russian Tereré) because this practice is more common with Slavic immigrants. Tereré was invented by the Guaraní Indians who lived in Paraguay and western Brazil (Mato Grosso do Sul). People usually prepare one jar of natural water and a "cuia" (Portuguese) / "guampa" (Spanish) with a "bomba" (Portuguese) / "bombilla" (Spanish) which is shared among the group of people. Look at the next photo...you see a cuia/guampa containing Tereré. Hi... thank you for your post about tererê. Warm hugs from Brazi.